Get this: Austin has an unemployment rate of only 6.7%. That could be why, except for South Padre Island, Austin now has the highest priced median homes in Texas: $194,600, according to the Real Estate center at Texas A&M University. Sales of existing single-family Texas homes in August were up 24 percent from a year ago, according to the most recent Multiple Listing Services (MLS) data compiled by the Real Estate Center at Texas A&M University. More than 21,200 existing single-family homes were sold, data showed. The median home price was $153,200, about the same as a year ago, and the state’s overall inventory was at 7.4 months. Based on the latest financial news, one might assume that very few people are purchasing homes this year. However, you might be surprised to know that in Austin, July and August home sales reached record highs. In fact, July marked the best month for Austin real estate in over 2 years! Here is a snapshot of the Austin real estate market as compared to one year ago. $524,492,455 – Total dollar volume of single-family homes sold, 23% more than July 2010. $196,750 – Median price for single-family homes, 11% less than July 2010. 1,973 – Single-family homes sold, 32% more than July 2010. 205 – Condos and townhomes sold, 45% more than July 2010. 77 – Days on market, 5% longer than July 2010. 2,808 – New single-family home listings on the market, 13% less than July 2010. 9,393 – Active single-family home listings on the market, 20% less than July 2010. 1,994 – Pending sales for single-family homes, 28% more than July 2010. One great example of an Austin community that has seen lots of growth in the past year is Scofield Farms. Price points: $300K. Located in North Austin, it has quickly become one of Austin’s most sought-after neighborhoods for new Austinites and their families. Scofield farms realtor Jenny Walker agrees. “Scofield is great for families because it is a very close knit community. Neighbors really look out for one another here. Scofield is also within walking distance of great schools and near high-tech employers like Dell, Samsung, and IBM” Jenny says. On the other hand, if you’re in the market to sell, keep in mind that there are 20% fewer homes on the Austin market than there were at this same time last year. In short, this means significantly less competition for those selling homes. After a challenging year in real estate, the Austin market seems to be back and holding strong. How do you spell a healthy real estate market? JOBS! On CandysDirt, I told you about Al and Erin Hill, that’s Al Three, who recently moved their family to Atlanta. 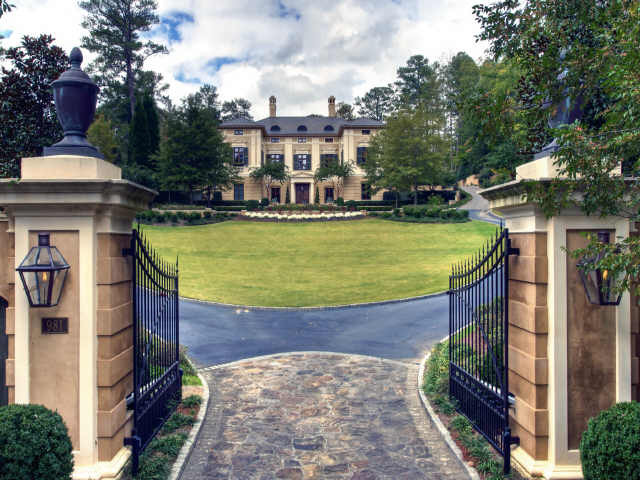 They bought a $9 million dollar estate in swanky Buckhead (think Highland Park on Strait Lane in Dallas), closed on it in July. Last spring, the couple had some legal problems involving a $200,000 HELOC — home equity — loan on their Highland Park home. A Dallas grand jury made some serious charges: three counts of making a false statement to obtain property or credit and one count of securing execution of a document by deception against the 40-year-old Hunt oil heir. Erin Hill, age 38, was charged with two counts of making a false statement and one of securing execution of a document by deception. The indictments centered on $200,000 (really, a drop in the bucket) from OmniAmerican Bank taken out in 2009 when they claimed to be sole owners of their $1.9 million Highland Park home: majority interest in the Highland Park home is owned by the Albert Hill Trust, the young couple only owns about 20%. There were some charges too about false statements and “securing execution of a document by deception.” At the time, Al Three did not have legal representation. Here’s what my sources tell me: Al Three recently fought to change the trustee of his trust, and he likely convinced the trustee to buy the $9 million Atlanta estate on his behalf. (Taxes on that spread are a mere $50,000 a year — what is Georgia doing right about real estate taxes that Texas is doing wrong?) Sources tell me his legal fees in Dallas have eclipsed $70mm, and certain very generous Dallas friends are chipping in to cover those. Now I wonder if the next purchase is a second home down in Destin? Changes coming over at Lakewood Shopping Center than could positively impact local homeowners. Steve Brown is reporting that Lincoln Property Co. bought the central block of the Lakewood retail district at Abrams Road and Gaston Avenue, 60,000-square-feet that houses the Dixie House and the cozy Lakewood Ace Hardware. 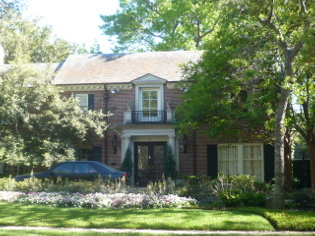 This property has been owned for years by the Corrigan family, and was originally built in 1939. Recently, restaurateur Matt’s Rancho Martinez announced it has lost its lease and will be moving to another nearby location in 2012. A Mi Cocina restaurant will take over the building that housed Rancho Martinez for 27 years. Lincoln, one of the city’s oldest developers, built the Old Town shopping center on Greenville Avenue and is a partner to redevelop the Village on the Parkway retail center in Addison, aka Sakowitz Village — if that doesn’t show my age!. According to Brown’s report, Lincoln officials say they have no major fancy-pants plans in store for the shopping center, but with the strength of the Lakewood real estate market, a little spruce-up might be in store.